Term: This is a one-year term, full time position, at 4 days (or 30 hours) per week, with a flexible work schedule and the possibility of renewal. Position Description: We are seeking a self-directed, energetic and organized individual to coordinate our Living Green Living Well (LGLW) project. The LGLW Coordinator is responsible for increasing our overall profile and actively engaging the community. This includes “greener living” messaging and activities through public awareness and education campaigns such as Waste Reduction Week, Plastic Free July, Earth Day, and other targeted campaigns; community presentations and displays; outreach to and collaboration with stakeholders from a variety of sectors, including business groups and community organizations, on current and time sensitive environmental topics and issues; assisting with policy work; and engaging the general public through blogposts, topical webinars and other public engagement opportunities. Background: Green Action Centre is an environmental, non-profit based in Winnipeg and serving Manitoba. We are a registered charity, governed by an elected board of directors, with a core group of passionate, dedicated staff. We promote greener living through environmental education and encourage practical green solutions for households, workplaces, schools, and communities. Our primary areas of focus are healthy and green commuting, composting and waste reduction, sustainable living, and resource conservation. We are located on Portage Avenue in the heart of downtown and part of the Eco-Centre on the 3rd floor of the MEC building. We need someone who is keen, capable and who has the initiative to make things happen. The Living Green Living Well Coordinator plays a key role in our efforts to increase our public profile and broaden our community impact. This position reports directly to the Executive Director and works collaboratively with the Office Coordinator and other Green Action Centre program staff. Research, prepare and post material on sustainable living topics and environmental policy for the Living Green Living Well area of the website. Plan and implement targeted, themed public awareness and education campaigns, such as Waste Reduction Week, Earth Day and Plastic Free July, to encourage public action and corporate sustainability. Develop and implement a public event series for Green Action Centre that feeds into and builds on planned campaigns and other opportunities. For example, film screenings, webinar viewings, guest speakers, landfill or 4R Depot tour, etc. Collaborate with the Office Coordinator to maintain a marketing, communications and outreach calendar, including opportunities for presentations, displays and editorial content contribution for the website, e-newsletter and social media. Curate, promote and deliver presentations on sustainable living topics to workplaces, community groups, and at public events in conjunction with other program staff. 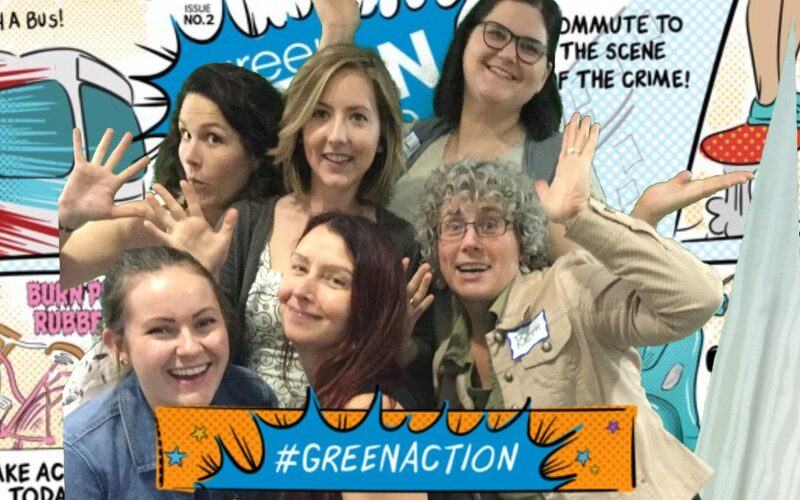 Support Green Action Centre’s policy committee, including coordinating meetings, recording and distributing minutes, and ensuring the presence of policy-related content in public communications, such as the website, e-newsletter and social media. Seek and develop relationships and joint initiatives with community and business groups and other stakeholders through participating in meetings, networking and community events. For example, the LGBTQ* Chamber, Winnipeg Chamber of Commerce, Bike Week Winnipeg, and campus sustainability offices. Prepare project proposals and reports for submission to the Executive Director, and maintain project lists, records and contacts. Manage project budget, including regular review of project revenue/expenses and tracking of project expenses to ensure they are within approved project budgets. Contribute to the overall objectives of the organization including staffing displays, supporting key Green Action Centre events, attending regular staff meetings and routine office tasks. Remuneration: $19.75/hour (30 hours/week). A monthly Winnipeg Transit Eco-Pass, or financial equivalent for cycling or walking, is provided through Green Action Centre’s “Active Transportation Benefit” policy. Term Position: The term is for a one-year period, expected to begin May 7, 2018, with likely extension subject to mutual agreement between the parties and status of project funding. To Apply: Applications will be accepted by email only until the deadline. If this opportunity interests you, please email your cover letter and resume to jaret@greenactioncentre.ca with “Living Green Living Well Coordinator Position” in the subject heading. Submission of a writing sample is also encouraged. Please note in your cover letter if you are an applicant between 18-30 years of age, which may qualify under the United Nations Association Canada’s Green Employment initiative.